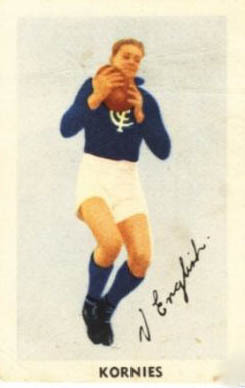 Vincent ‘Vin’ English was a fine centre half-back for Carlton in one of the least-successful periods in the club’s history. In seven seasons at Princes Park, he wore the number 14 guernsey in 115 matches. Sadly, only one of these games was a final – the 1952 Semi-final, against Fitzroy. English played a blinder that day, and was voted Best on Ground. But Carlton lost that thriller by just one point, and Vin never got another chance at September glory. Yet another product of that prolific producer of league talent, Bendigo League club Sandhurst, English endured a long apprenticeship with the Reserves at Carlton before he was given an opportunity with the senior team in 1950. He soon settled into the central defensive post and was hardly ever played anywhere else for the remainder of his career. English wasn’t blessed with natural speed, but he more than compensated for this one shortcoming with his concentration, durability and strength. A safe mark and a long driving kick, he was renowned for his close checking and was rarely beaten one on one. Throughout Vin’s career, Carlton was anchored on the middle rungs of the ladder – with just one exception. In 1952 the Blues climbed to fourth and booked a Semi-final berth against Fitzroy. More than sixty thousand supporters packed into the MCG on a warm Saturday afternoon to see Carlton hold sway for most of the match, yet fail to capitalise because of their atrociously inaccurate shooting for goal. Vin English dominated that game for the Blues. Ranging across half-back, he took mark after mark to turn back countless Fitzroy attacks. Yet somehow, they still found avenues to score. With only a minute to go in the match, Fitzroy 10.8 (68) were level with Carlton 8.20 (68). That was when the Roys’ skipper, ‘Baron’ Ruthven, snapped a point from deep in a forward pocket and the Blues went down in a heartbreaker. Nine extra scoring shots should have been enough for a comfortable win, but in the end they weren’t. That devastating loss was the first and last taste of finals football for Vin English at Carlton. 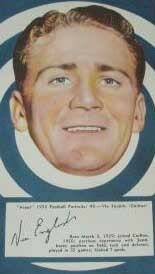 He played on for another four seasons for a best result of fifth in 1953, before finishing up in 1956. Afterward, he could rightfully claim that he played over 100 senior VFL games, and that he was judged Best on Ground in every one of his finals. After his stint in the VFL, English later coached Colac in the strong Hampden League. Prior to joining Sanhurst, Vin was a member of the Coolamon and Methul club in NSW. Contributors to this page: Bombasheldon , blueycarlton , Jarusa , molsey , WillowBlue , pblue , p(12)terg , PatsFitztrick , TruBlueBrad , nikki and admin . Page last modified on Sunday 02 of June, 2013 12:32:21 AEST by Bombasheldon. 2001 Ansett Cup - Kris Massie takes a ride.